Liminal states :: My “interventions” are admired! Both of these points strike me as useful, and true. I would only add that I suspect many supporters of the motion have been generalising from limited experience, too. I don’t have a lot of experience with the Oxford Debate 2.0 format they’re using. Does this mean I get to say “hi mom”? JON PINCUS wonders where to find past posts from “featured participants”, including posts from previous debates. A fair point. They come and go, leaving no obvious trace, except on the Facebook group at http://www.facebook.com/group.php?gid=21114626408. Check there for guest comments on this debate from Parry Aftab, Judith Krug and Ann Flynn, each of whom did a great service by bringing sections of the discussions into sharp focus. This simultaneously illustrates the “pro” camp’s points about better information diffusion on social networking sites and the “con” sides concerns about technology in today’s context tending to favor privacy-invasive ad-funded corporate environments. So … one more intervention: I put the links up on a wiki page, which also kicked off a new Educational networking section in the Education wiki Wikia. Update on 1/31: when they closed down the participant comments, guess who wound up with at the top of the first page? And the bottom as well … it took me by surprise because they had said they were going to leave it open until February 1, but I guess it worked out okay. Posted by jon on Thursday, January 24th, 2008, at 9:16 am, and filed under entertainment, Professional, social sciences, Tales from the Net. I pulled together my interventions with decent formatting … it’s interesting to read them over. A question for the moderator: wouldn’t it be useful to include some current (or at least recent) students as featured guest participants? As somebody coming from a social computing and web strategy background, rather than education, this debate is very interesting to me. Structurally, by not providing any mechanism for commenters to link to outside blogs, or an RSS feed, it really highlights the lack of familiarity of the organizers with web-based discourse — simply calling it the “2.0” rules isn’t enough. Conversely, are there ways to use social networking technologies’ in the curriculum to *broaden* and democratize this access? Yeah, I know, it’s The Economist, so I should set my expecations appropriately … still, it’s disappointing that neither of the participants have found this topic worthy, and from a quick scan I haven’t seen it coming up in other discussions. While I’m generally sympathetic to their perspective, I’m surprised at how narrow a focus the “pro” camp is taking — and how they continue to ignore both the significant criticisms of the SNS’s and other social computing software as they exist today, the potential systemic barriers to realizing the empowering future they sketch, and the risks that the new technologies will in practice reinforce (rather than counter) existing negative biases and trends in the educational system. Something that leaps out at me from the comment string is how many people on the con side are generalizing from very limited experience with social networking technologies — and don’t seem to view this as a problem. Even after a couple of decades of living a chunk of my life online, It took me several years of participating deeply on a variety of social networks before I started being able to using them effectively for different tasks … and by “deeply”, I mean regularly spending 20-40 hours a week in this environment, and learning from the “digital natives” [high-tech jargon for those who have grown up with the technologies — in the social networking space, typically 25-27 and younger]. Believing that you have a deep understanding of these radically different environments without having put in the time to gain mastery, and without the humility to realize that it’s *you* who will need to do the learning, is a recipe for woolly thinking. The “unlike us responsible adults, kids don’t *really* want to learn” tone of several remarks in the stream and Dr. Bugeja’s rebuttal is particularly amusing in this context. I read this as an expression of entitlement-under-thread: in this new world, the other claims on the student’s attention are much higher — and the evidence that they students are disengaged is much more visible, both to the teacher and to other students. It’s disappointing to see people responding to these engaging technologies by saying “ban them”, rather than “how do we discover the situations in which these obviously-engaging technologies can be used to improve engagement”. 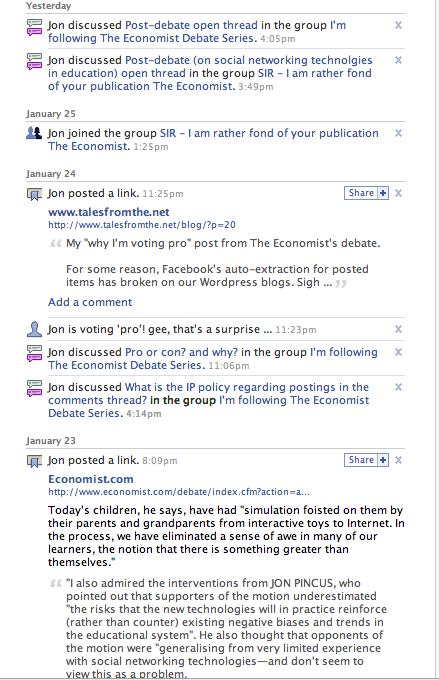 All that said, I think the discussion as a whole — including Ewan’s blog entry and Michael’s detailed posting in the thread on danah boyd’s blog — really does serve as an illustration of how social networking technologies can potentially change learning: a participative experience that’s crossed the boundary out of the “classroom” (aka “debate all”), where the “teaching” and “learning” roles are far more fluid than in traditional settings, and where new participants from other communities, disciplines, and backgrounds can just show up and jump in. I wonder how much the 32% who are currently voting “con” are aware of this — and how much they just believe that educational institutions won’t be able to tap this power positively without falling prey to inertia and special interests. Well said, flexiblefire — and thanks, PostColonialTech, for highlighting the commonalities. Earlier this month, Marc Andreessen posted enthusiastically* about the education-centric Ning networks that are proliferating “like bunnies”. Has anybody reached out to those networks to get their perspectives on this topic? If there are some ongoing discussions there, would somebody be kind enough to posting some links? and a question for the moderator: what is your recommendation for people who would like to track the extended conversation in the blogosphere? Ewan, danah boyd, Will Richardson, and John Connell all have interesting threads on this — and I’m sure there are lot more elsewhere that I and other readers would also find valuable. A question for the moderator: is there any way for interested readers to navigate to the past “featured participants'” posts? Alas, I forgot to bookmark them. Updating the “about speakers and guests” page with links to their posts would be greatly appreciated. 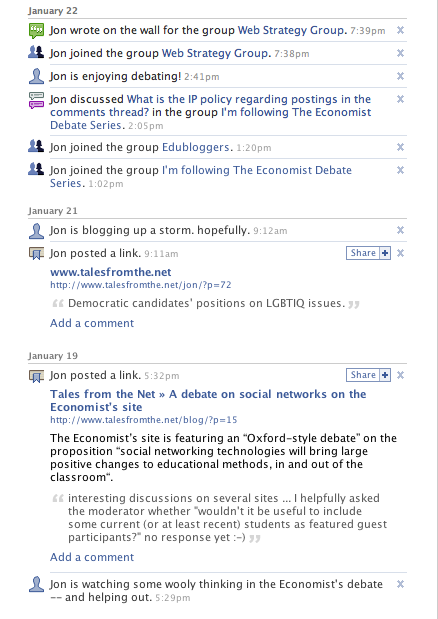 Amusingly enough, there is currently a link to Ms. Krug’s comment posted in the Facebook group the Economist set up for this debate — and not one on this site. Thanks for the praise, Moderator. Always glad to help!Several people have told me they’ve found the summary-and-links I’ve posted at http://www.talesfromthe.net/blog/?p=15 useful. If anybody has links to any quick summaries of the rebuttals and closing statements, and the contributions of the other guest participants, please let me know — thanks! Wow, jixavius, what an excellent and graphic example. Somebody in this thread recently described social networks as “faceless” and claimed that it’s harder to evaluate people accurately there. That’s exactly wrong on both fronts. There’s a reason it’s called “Facebook” — I see my friends faces next to our email threads (and on my “main” page), and their profile pages have a lot more information. The same’s true for people I don’t know yet, and while it takes a while to learn the skills, different levels of credibility decisions can be made surprisingly accurately and rapidly — in my experience, far more so than in person. And as Jihad K_ shows, for those who don’t have googleable articles or CVs establishing their reputation, this makes a huge difference — and leads to all kind of learning. > Whereas a debate section of Economist.com is implied to be a SNS. The software powering*** the Economist’s debate fails two of the three prongs of their test; it does however provide a profile page. So suppose a bunch of the people involved adopted the convention that they’d add a comment with one or more links [or some other pointer, perhaps a googlable phrase] to sites where they expose their social network: friends lists, CVs or Google Scholar or Citeseer references with links to co-authors, blogrolls if that’s how they use them, etc. Drat. I hate it when quotes render badly. Grr. I’d like to add my voice to the chorus expressing appreciation to the speakers, guest participants, Moderator, and all the commenters here and in the blogosphere. In particular I’d like to compliment Nancy Willard on her guest statement, which in my opinion sums things up magnificently. I hope that the dialog and mutual participative learning continues. In aid of that, I’ve set up a page on the Wikia Education Wiki — unlike the Facebook group, this is viewable without requiring an account. I’ve started it off with some initial links and structure. Please join in, and help flesh out this page, as well as the new section on Educational Networking. In various discussions, for example on Slashdot, tech-savvy folks point out that the only safe assumption is that any picture or text uploaded to an internet site is likely to be made public at some point. People following this guideline would suffer at worst some embarrassment from the data leak. Echoing the point made by Dr Willard and others: helping students learn the issues like this is critical.